Thank you to Stash Builder Box for providing the supplies for this post. I don't sew much with quilting-weight cotton. Although I used to make all my clothes with quilting cotton, now that I'm generally more confident in the success of my garments, I'm more willing to splash out a bit and pick up a fabric more suited to the garment, like a rayon challis for drape or a pretty seersucker for a summer dress. However, there are certain fabrics that you just have to have and that only come in quilting cotton (Sommer Plockade I'm looking at you). 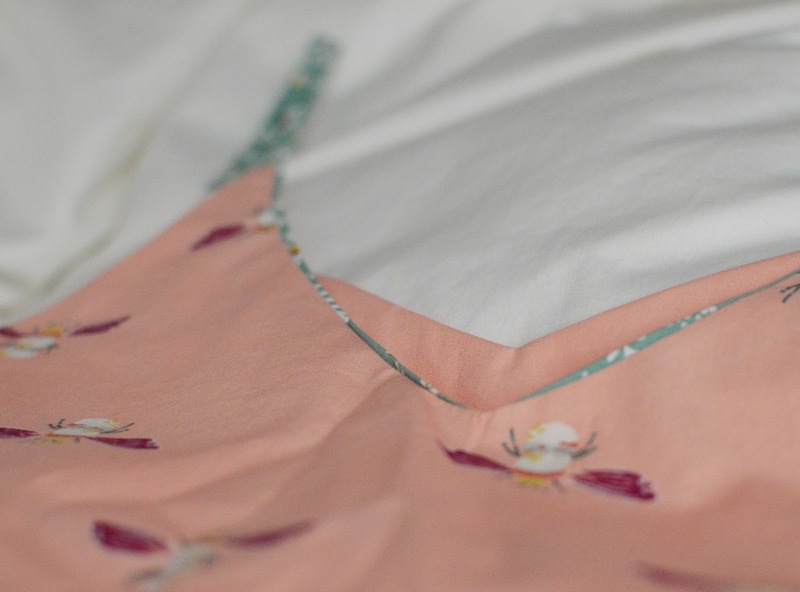 Here are five ways to use quilting cotton as a dressmaker! 1. Bias tape. 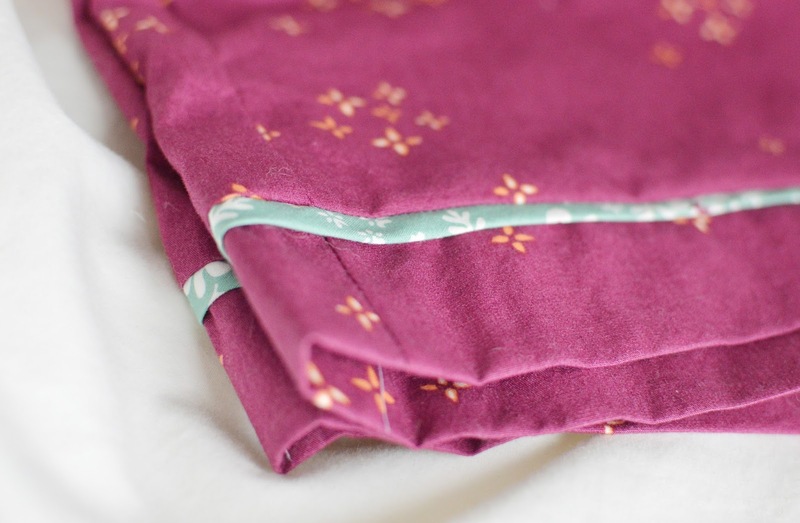 Making pretty, special bias tape to finish your hems and enclose your seams is a wonderful way to use that fabric that you just can't leave on the shelf. All you need is a bias tape maker, a little tool which you can pick up cheaply on amazon or at JoAnn, and a tutorial on how to use it! This works well with small-scale prints, but also looks cool and abstract in a large floral, for example. 2. Pajamas. 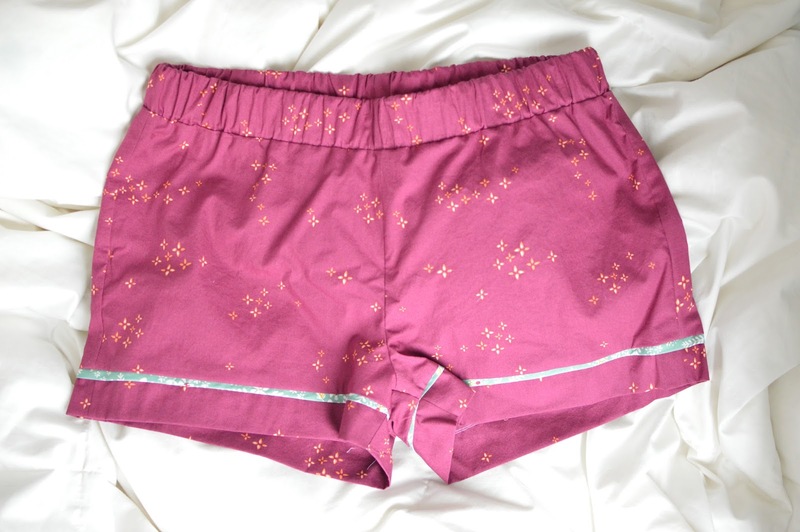 Although you probably can't squeeze a whole pajama set out of fat quarters without some creative piecing, the Stash Builder Box contains three full-yard cuts in coordinating prints, which was enough for me to make an Ogden Cami and a pair of Carolyn pajama shorts with a little bias trim! 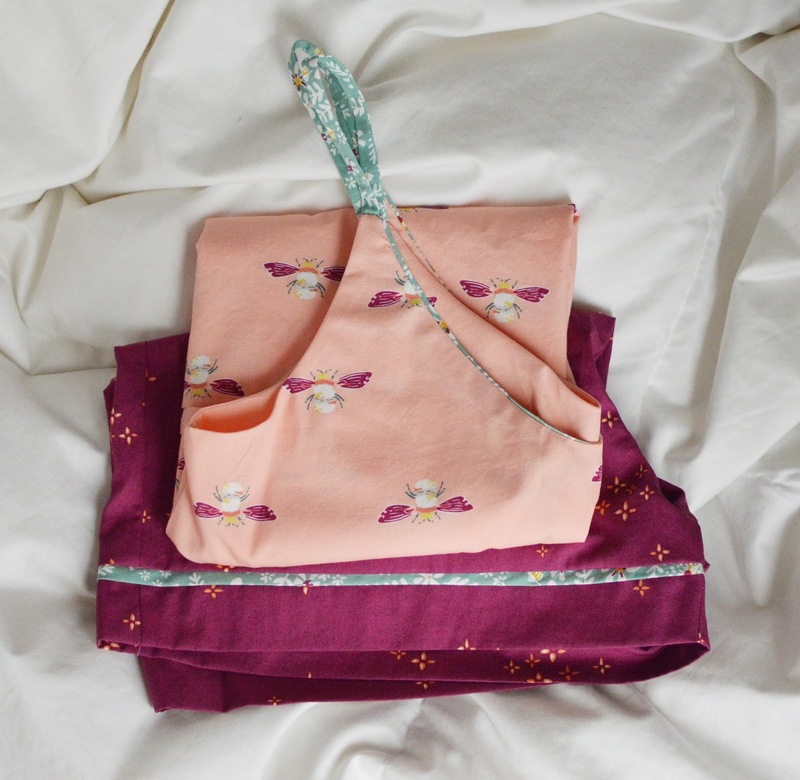 Mine contained three fabrics from Maureen Cracknell's Garden Dreamer collection for Art Gallery Fabrics which (obviously) go together perfectly, and anyone who's ever touched AGF's cotton knows it is soft, not stiff at all, and perfect for fun and comfortable pjs! It's a little bit cold to be wearing tank tops to sleep but I think Ogden and Carolyn will be my go-to summer pj set. 3. A full, gathered skirt. This will always look great in a quilting cotton. (I used a quilting cotton from Sarah Jane's Sommer Collection for Michael Miller in my class on how to make a gathered skirt.) If you can find a border print, you're really in luck! 4. Children's clothing. I'm not much of a childrenswear sewer, but if you love quilting cotton, have some little ones in your life and do. not. quilt. some selfless sewing could be your answer! There are a lot of prints that are absolutely adorable and I know I won't wear them since (in my opinion) they're too childish for adult clothes--I'm always tempted to buy them just to have them. I obviously need to befriend some small children. 5. Whatever you want! Although I wouldn't recommend going after a bias cut 30s dress in this quilting cotton, I often make wearable muslins of my 60s dresses in printed quilting cotton, and guess what? They're called wearable for a reason. They look really cute, with a huge array of pretty patterns and prints suitable for day dresses. Some people swear off quilting cottons entirely as apparel sewers, but you really can make a lot of stuff using this oft-maligned weight... so go for it! Do you use quilting cotton, or just stare longingly at them in all their variety? Would you consider a subscription to something like the Stash Builder Box as a non-quilter? How cute is the pencil--a new crafty phrase each month! I used to hate using bias tape but then I learned to press the bias tape into shape--so if it's going on an armhole, press it into a curve--before applying it and it made SUCH a big difference! I love it now. That's a great tip! In my first sewing career, we never had time to finish seams, and now I'm usually to excited to wear my garment to properly finish with bias tape or another method, lol! Agreed, this is a great list for stash busting your pretty quilting cottons. Especially like the pajamas idea. I often fall in love with prints that are a bit too juvenile or bold to wear out and about, but make perfect pajama fabric! I'm continually impressed by your dedication to lining things since I can never be bothered and just wear slips ;) I'm going to have to keep all my quilting cotton scraps around for all those little uses! I've made a number of sleeveless dresses from floral quilting cotton. Simple, fitted bodices don't require fabric that drapes. Another fun way to use little bits of quilting cotton is pocket linings on heavier weight fabric projects (like denim or twill). There is nothing better in the summer than a pretty cotton sundress--the perfect use for quilting cotton! Also, this pj set is so cute! I second Emily's comment RE: using quilting cotton for linings, facings, etc. Also pockets! You always can do little home dec things - potholders, ironing board covers, etc. — with quilting cotton. It's nice to see those novelty prints spring up in everyday life! Another suggestion — an infinity scarf. The Dec/Jan edition of Sew News mag has a nice infinity scarf pattern that calls for pieces of multiple fabrics. So if you didn't want to make a whole dress out of a favorite quilting cotton, you could use it in a lesser way in a scarf! I refuse to make garments for myself out of quilting cotton save one theme project I did a couple of years ago (although PJs might be on the table thanks to your set!) but those prints are so hard to resist, aren't they? Now I have an excuse! =) I have used them to make potholders and they're perfect for applications like that, especially since you can mix and match so many things in a smaller project without it being overwhelming to the eye. Thanks for the suggestions!